Sergey Tkachenko is a busy coder who released dozens of tools throughout the years for Windows on hits website Winaero that help Windows users change specific features of the Windows operating system or programs running on it. Aero8Tuner for instance allows you to enable transparency on Windows 8 while ColorSync was useful to sync the desktop and Start Screen background color on the operating system. Sergey released a first public version of Winaero Tweaker today. The main idea behind the program was to merge the majority of tools that he has created into a single application. This was done for several reasons. First, it benefits users as they only need to download one program to make changes to their system instead of several ones. 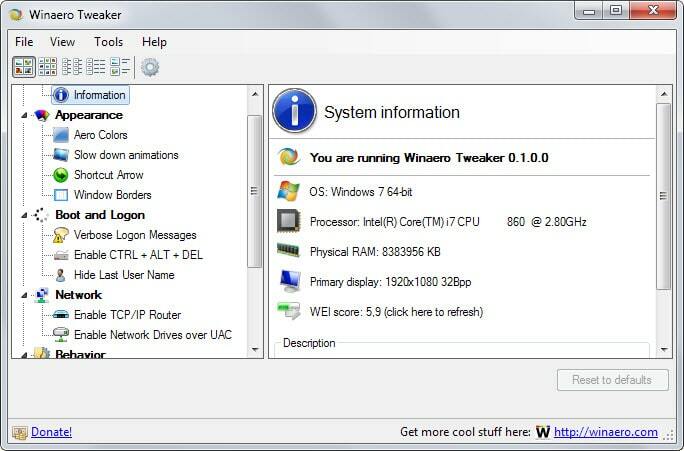 Since Winaero Tweaker is compatible with all currentl versions of Windows starting with Windows 7, you will also never run into issues downloading a program only to find out that it is not compatible with your operating system. For Sergey, it means a streamlined development process as he can concentrate development on a single tool instead of dozens. The program itself is portable and can be run right after installation. The options that it makes available depend largely on the operating system it is run on. The screenshot below highlights the options on a Windows 7 Pro system. Options are divided into groups such as network, appearance or behavior. Each tool or tweak you can make is listed underneath the group it has been filed in. Depending on what it does, it may be a simply checkbox that you can activate or a complex tool that displays several selection options, sliders and menus. Most options provided by the current version are simply on/off switches. You can enable or disable the built-in administrator, UAC or Aero Shake for example. A description is provided for each tweak that explains what it does so that you never have to guess or research it before you understand it. The program displays operating system specific tweaks as well. This makes sense considering that some features are not available in previous (or later) editions of Windows. If you run it on Windows 10 for instance, you get four additional tweaks that allow you to enable the experimental login screen, modify update settings, enable the new date & time pane, and enable the resizable start menu. Besides those, additional tweaks may also be displayed in other groups. Tweaks are applied automatically but a reboot may be required for some. 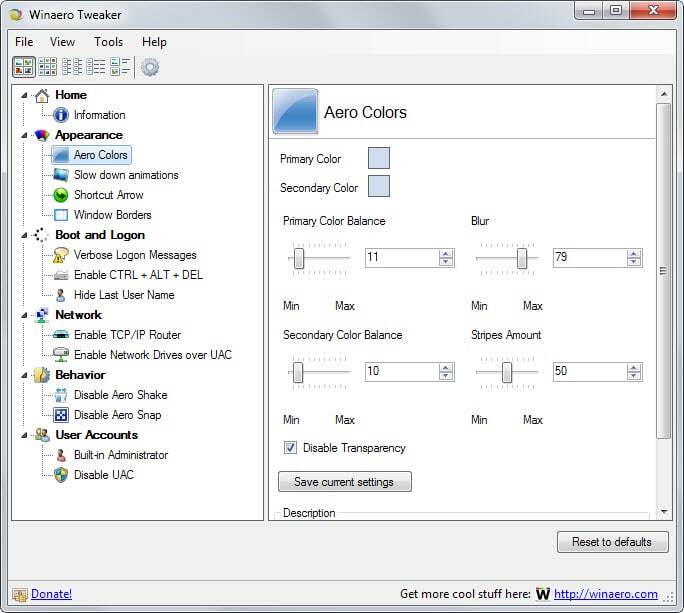 Winaero Tweaker offers a reset option which resets all settings to their default values. The success of the program depends largely on updates. If Sergey manages to get them out in time, for instance when new Windows 10 tweaks or features become available, then I can see it become quite popular. It needs a content infusion though as it is thin on content currently when compared to other tweaking solutions for Windows. Few interesting options that I think are not included in UltimateWindowTweaker. Does this include takeownership or that functionality? Winaero tools are simply awesome and they don’t mess up your PC unlike some other tweaking tools I tried from sites like TheWindowsClub etc. It’s amazing how many tools Sergey has got. I hope he merges them properly. It will be one hell of a unified tool to tweak Windows. NirSoft, SysInternals and Winaero are IMHO the top-tier tools. WinaeroCharmsBarKiller is a terrific tool that prevents annoying charms bar pop ups, for those of us that find the charms bar to be nothing by an annoyance. Very small, but 100% effective. Keep up the good work Winaero. Now, off to download their tweaker. WinAero has many useful applications listed on their website and took notice last time I was trying out Desktop Background Tuner. Also found Cursor Commander along with ModernUI Tuner for Windows 8, that’s probably included with Winaero Tweaker. Look like could be very useful, thank you. as i understand, its portable, but if needs to run constantly (for some functions) then best to install on pc rather than a usb?